On July 5, 2009, in Urumchi, Uyghur men, women and children peacefully assembled in People’s Square to protest government inaction over a deadly attack on Uyghur factory workers in Shaoguan, Guangdong Province. The details of what happened that day, and over the following months, have been unclear. What is known is that the city erupted into unprecedented unrest that resulted in the deaths of an unknown number of people. Since July 5, 2009, Chinese officials have spared no effort to silence and intimidate Uyghur voices about the unrest, and have actively sought to suppress information that contradicts the official narrative. Besides a 10-month communications blackout, harsh punishment for Uyghur webmasters and journalists aided official efforts to manage and control information emerging from the region on the unrest. 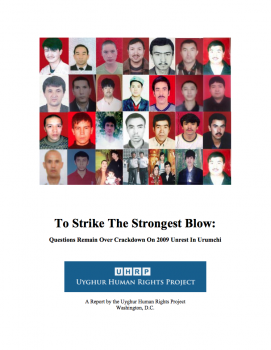 In the past year, UHRP accessed an extensive archive of Chinese state media reports spanning the period of July 2009 to February 2010 from the Urumchi Evening News, a small proportion of which are cited in To Strike The Strongest Blow: Questions Remain Over Crackdown On 2009 Unrest In Urumchi. The archive, predominately in the Uyghur language, reveals how the Chinese media built a narrative of the unrest after the state initiated the 10-month information blockade by cutting off both telephone and Internet communication in the entire region. The archive also demonstrates how in building that narrative, the Chinese government account, especially of the post-unrest detentions, lacks sufficient clarity, a finding which should cast doubt on the state’s version of events. The report also includes interviews conducted in 2010 and 2011 with Uyghur eyewitnesses to the post-unrest security crackdown, as well as the reporting of human rights organizations and overseas media. Four years following the unrest several questions over due process in trials and detentions, enforced disappearances and torture remain. Four years after the unrest many Uyghur families across the region do not know what happened to their relatives. This report also documents how the Chinese government heavily employed video surveillance to single out individuals who had participated in a peaceful protest for detention. Further troubling aspects of post-July 5 East Turkestan are reports of minors arbitrarily detained, tortured, sentenced or simply disappeared. This element of the Chinese government’s security crackdown puts the People’s Republic of China in contravention of its obligations under the Convention on the Rights of the Child, particularly Article 37. The overwhelming pattern emerging from what documentation is available is lack of clarity from the Chinese government on a number of issues. It is unclear how many Uyghurs were detained, tried and forcibly disappeared. This absence of transparency is especially troubling in terms of human rights, as any process of redress cannot be initiated without accurate details. UHRP believes international pressure should be applied on China to sign and ratify the International Convention for the Protection of All Persons From Enforced Disappearance and to ratify the International Convention on Civil and Political Rights.